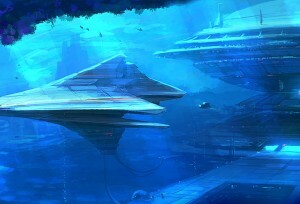 Underwater alien bases have been explored relatively to a good extent, though their popularity has been relatively lower, and the subject has been seen as a less important facet of UFO exploration. This is because no hard evidence that any intelligent civilizations have ever established in our oceans, whether it be human or alien. However, myths such as the long sunken island of Atlantis and a few other incidents that happened in the Bermuda triangle seem to suggest that there is a lot of activity taking place in seemingly isolated aquatic strips. The fact that there have been many nuclear experiments taking place in remote islands of the Pacific is one factor that has determined many to question whether or not governments might be hiding or may be researching underwater alien bases and the fact that a lot of the budget of the Pentagon is not accounted for, seems to indicate that a lot of money might be flowing into these areas of research and/or development. There are also other human made relics that have been uncovered especially of Mayan provenance, which seem to indicate that technologies to submerge under water were developed even from these periods. Whether these were produced by us, human beings or were technologies that were alien, it is still debatable, but certain objects which seem to have been parts of a submerging system might indicate that we were into exploring the underwater world as well. Overall, there is no overwhelming evidence that there might be any alien bases submerged underwater, but there are still incidents that remain unexplained and that might indicate activity under our oceans that we know not about. But, the failure of the general public to be captivated by this particular niche subject is why more materials fail to emerge, as is the case with UFOs. ← who were the anunnaki ? Ancient airplanes were not typical to India and Egypt; you will be surprised to know that golden trinket-like structures were found in America too that resembled aircrafts. Stratigraphical studies conducted on these gold models have attributed them to a period .